Yes, residential real-estate remains in the throes of the worst downturn since the Great Depression. Yes, home prices are the lowest in six years and still falling. And yes, it still takes three quarters of a year to sell a house. Nevertheless, the market might have turned a pivotal corner last month, if a surprising increase in existing home sales is any guide. The inventory of existing homes for sale fell 11.7 per cent to 3.68 million units in December, translating into 9.3 months of supply. "But, six months is the natural rate of inventories, so supply remains high,"
Will we see a similar piece in 2011 encouraging us to take bold action by making the switch from renting to buying in a falling market in the TC? We won't have to, I'm guessing, because the TC and the real estate industry organizations who advertise within will encourage us to take bold action on a semi-weekly basis to take advantage of "once in a lifetime opportunities" the whole way down... no matter how long that takes. What happens when we recover? Industry and media wants us to keep this current downturn in perspective. We're told by the BoC that this will be a short and steep dip, followed by a fairly quick recovery. We're told by the real estate experts that this is a crisis of confidence, not a crisis of fundamentals being out of line. 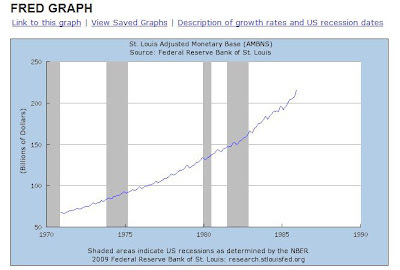 In the 1970s, after a period of stagflation, governments rapidly expanded monetary policy, that is, they dumped money into the system to stimulate their economies. It was a developed-world wide phenomena that led to a quick and dirty uptick in household spending, and also spending on houses. When their monetary policies led to crazy inflation levels, they did what all governments do, and jacked up interest rates by almost double in just two short years. Fast forward 32 years and they did it all again. Economic demand sucked after the dot com explosion and 9/11. Greenspan and then Bernanke, and by proxy, David Dodge and then Carney, opened the monetary taps in the US and Canada. 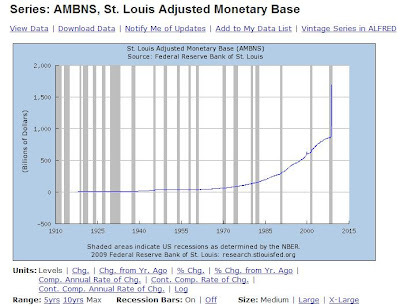 The money supply became so cheap it was almost free. Kind of like it still is today. House prices soared, people racked up debt like kids collect candy on Halloween. And no one understood what was happening nor why. The situations are very similar. However, the volumes are very different. Take a look. 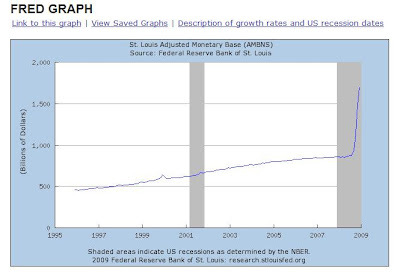 We've expanded the money supply, so fast, and so far that we've outstripped the 1980s S&L crisis and yet Obama is still looking for almost this much money to be dumped in again. If the BoC is right, and we recover relatively quickly from this downturn, then interest rates will have to climb in order to absorb the excess cash to keep inflation in check. How far up will they go and what will be the impact on local house prices? 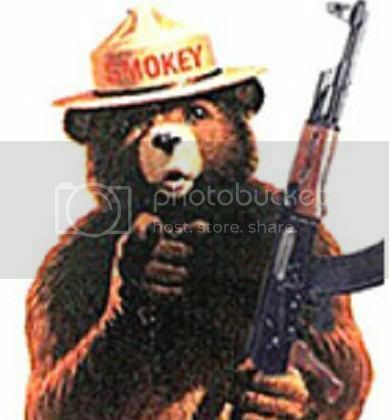 In the spirit of the new Obama-US love in: I believe we have a duty to protect the constitutional right to bear arms, er, to arm bears... yeah, arm bears, that's it! Sales will pick up this spring. Not much we can do about (not that I'm arguing we should do anything either). But we can help those smart enough to wait out the first 13% drop in prices before hopping into the market. And we can also help those of us waiting for at least the next 13% before we start shopping for boxing day deals. This post is dedicated to arming bears with low-balling tips. If you're going to buy this spring, make sure you buy with the end in mind. Don't settle for 2007 prices when prices may head all the way down to 2005. Stephen Covey, the leadership guru, tells us in his 7 Habits book "to begin with the end in mind." For me, the end is 2005. I'll be good with 2005 prices. That's where I'm going to start. And gosh golly gee, the good folks at BC Assessment and their friends who run my PCS service have made it that much easier for us to begin with the end in mind with their "tax info" page. Pretty simple stuff here folks. The "real" assessed value for today is the lesser of 2008 or 2007. Ignore those numbers. Jump all the way back to 2005. Red light stop, green light go. If I were to make an offer on this over-priced fixer upper with limited square footage potential, I'd start at $285K. Seems harsh doesn't it? I might have a hard time convincing my buyer's agent to deliver that "insulting" offer, but in today's low sales market I doubt it. It's a buyer's market and, gosh darn it, it's my turn at the wheel for a change. I think the savvy REALTORS understand this and will do the buyer's bidding. 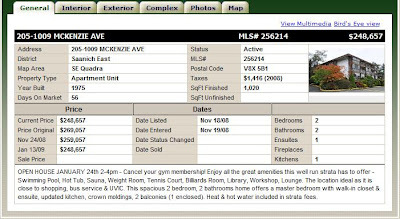 Anyway, back to the offer: $285K is a low-ball offer of 19% off the asking price of $349K. It's only $65K. Remember the vendor has already priced their property at just above 2006 prices, so they know which way the market is headed and they're trying to beat it. Good for them. Better for the buyer though. But here's the catch for armed bears: don't get sucked into the counter offer nonsense. It's the number one tool in the car sales game and it's made its way into the real estate world too. The game is we go back and forth until we meet somewhere, the winner is usually the one who gets the other to move farther from their original position. You can beat the game by not playing it. Offer is final, and conditional to inspections. Walk away if they won't play on your rules. If the offer is rejected, move on to the next target. This spring will be a target rich environment. So put on your dress whites, find the loving feeling you lost, and be the Maverick. You've got nothing to lose, and the best part about playing the game with this simple rule is the longer it takes the more you will save. Beautiful isn't it? So folks, that's my one tip for arming bears. We all know there are many more out there. Please add yours in comments and do your best to serve the real estate constitution first amendment: the right to arm bears. This presents an interesting quandary for the BC government's residential tenancy branch. Tsur Sommerville of UBC's Sauder School used a flawed (IMHO) Craigslist survey of market rents last year to conclude that Vancouver real estate was only 11% over-valued based on "market rents." Since that study was published, Vancouver prices have fallen 19% and show no signs of slowing down--and yet people aren't flocking to purchase rental units because they are suddenly cash-flow positive for the first time in half a decade. Craigslist is not, and cannot ever be, a good source of statistical information. Institutional real estate investors are not, nor can they ever be, like individual condo owners who seek to cover their costs for their condo investment. Which is precisely why CMHC does not count individually owned rental units--the economy of scale is nowhere even remotely relative to what is actually happening in the rental market. An apartment is not a condominium. Gordon Nelson Investments did not pay condo-equivalent market prices for their real estate investment purchases in the West End last summer. They bought apartment buildings, not condo developments. They knew the income the rents bring in and they knew the price they were paying for the building. If their numbers didn't add up to a good ROI, why did they buy? I'm guessing the numbers did add up to a healthy ROI. I'm also guessing this is part of a wider trend by investors and developers to argue that prices are indeed supported by rents and thus keep up the artificially inflated valuations of their properties; I am not suggesting this is a coordinated effort. CMHC states that average rents for Vancouver two-bed apartments are $1124 per month. In the downtown region, they give numbers for condo rentals and apartment rentals at $1604 and $1075 per month respectively. They also indicate a year-over-year reduction in rental prices by 0.3%. I'd like to say I'm confident that the BC residential tenancy branch will reject this Craigslist market-based claim for the nonsense that it is, but I'm not. It remains clear to me though, this is a case of someone trying to argue apples are oranges, and that "someone read somewhere" that oranges were selling for 50% more than they actually are, and the market for each should be the same despite the fact that it's not. I'm keeping my fingers crossed that wisdom and quality research prevails. The precedent setting nature of government decision making tribunals could be troubling for renters all over the province. How suite it could have been? I try not to use this blog as a political soapbox. Sometimes I can't. In today's TC (H/T to Muriel for the tip), newly-elected Mayor of Victoria Dean Fortin announced a program to create incentives for homeowners to develop secondary suites. The program, to cost $250,000, is meant to add up to 50, yes that's right folks, 50 suites to the pool of rental housing and get the proverbial 3 kids and their mom out of some Gorge Road hotel suite. The suites are already there Dean, they just aren't suitable for more than two people, and many people won't rent secondary suites to families. The real problem in Victoria is no one officially knows the true number of scondary suites and everyone thinks they are rented, even when they are not. This $250,000 would have been better spent on a civic registry and database of suites so that Victoria could have a more accurate accounting of rental accomodation and vacancy rates. The current system, courtesy of CMHC, doesn't count secondary suites or investment condos. Heck, it probably doesn't count anything built after 1978. The suites exist. The problem is the tools to influence the market don't. 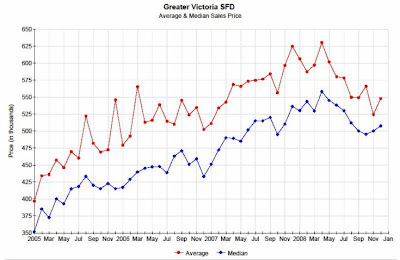 Everyone thinks there is a dearth of vacant properties in Victoria. That's why new homeowners think it's true market value to charge $800 a month for a mouldy basement bachelor with five and a half foot ceilings. And the lack of true information is why renters in this town grudgingly agree to pay Cook St Village prices for a leaky basement suite behind George Jay school. Dean's incentive program only applies to residential neighbourhoods like Fernwood, James Bay, Vic West and Fairfield; that's right, take a drive through any of these neighbourhoods and you can see the vast number of suites that already exist based purely on the lack of street parking and the foot traffic headed around the side of homes. How can you possibly add suites to areas already saturated with them? Dean, you just created a useless nightmare: you'll have no impact on rental numbers or availability and your office will be flooded with irate homeowners pissed because it's hard enough for them to back out of their driveways without hitting a parked car as it is. Your program will do nothing substantial to help the people that need it: I'd rather support you if you had announced you were going to hand five grand a year to 50 single parent families living in a hotel room to offset the cost to get into market housing. Of course, then you'd have to deal with the irate voters complaining their money will just be spent on beer and popcorn. The suites are already there; I believe the vacancy is too. Renters just need to learn about this and stop agreeing to pay outrageous rents. This, to me, is a missed opportunity to do something real for a problem that may not be as bad as we collectively think it is. We gave control of the information to the people who have an invested interest in driving prices upwards (higher rents support higher house prices). That was our first mistake. If this program passes, I'm sure it will be mistake number, er, well I'll let you decide if giving himself a $23,000 pay raise after a couple weeks on the job was Mayor Dean's first. If you agree with me, send Mayor Dean Fortin a note. If you don't, tell me where to go in comments. We've seen a lot of discussion and reports of people sitting on the sidelines lately. The real estate industry wants us to believe that sitting on the sidelines is a mistake and that if you're waiting for prices to come down drastically, you're wasting valuable "equity-building time." Last year, after the 2006 census, we learned that Canadians had reached an all-time high of home ownership. Over 68% of the 12.5 or so million Canadian households owned their own homes. I'm guessing that number continued to increase in 2007 and early 2008, if only slightly. That leaves about 32% of Canadian households as renters. Industry is targeting this market precisely because these are the necessary components of continued market growth. There will always be players exiting the market, they must be replaced if balance is to be maintained. In 2006, the census also told us that roughly 7% of Canadian households live below the poverty line. I think it is safe to assume they are not sitting on the sidelines waiting to buy. So our total sideline percentage is down to 25% or so. Considering that you need a minimum household income of $55-$60K to own Victoria's cheapest condos, that leaves a very small percentage left sitting on the sidelines here, if the national census numbers translate evenly to the local ones. Annual sales are forecast to be somewhere around 170,000-180,000 across Canada in 2009, down from somewhere around 220,000 in 2008. In Victoria last year we had 5820 unit sales. For argument's sake, let's say we track the national trend of an approximate 20% decline in sales, we'll have somewhere around 4600 in 2009. How many of these will be to new entrants? Just how big is the segment of households that are apparently just sitting on the sidelines waiting to get in? In the time I've been blogging, I'd say at the beginning about 1 in 10 people I ever spoke with about real estate had similar bearish views to me. Now, it's probably closer to 5 of 10. 4 of those 5 don't want to talk about real estate and the 1 left usually has a property they need to divest themselves from, so they're keeping a positive outlook. My point here is you would have had to be preparing yourself over the past year, at minimum, to be a qualified sideline sitting, able-to-purchase household. I don't think there are many prepared and adequately finance-able households to bring into the market right now. If I was to wager a guess of total households in Victoria that are currently renting and capable of buying given today's requirements/conditions I'd cautiously put the number somewhere between 500-1000. With 3800 units on the market at the end of December 2008, even if they all jumped in over the next 6 months and available listings only climbed to 4500 by mid-summer, their impact on prices will likely be negligible. 2nd floor. Likely owner-occupied. Likely not a "motivated" seller. Unsold. 3rd floor. Likely not owner-occupied. Definitely a motivated seller. Sold. Man, that first seller must be pissed. Because one unit sale just established a new benchmark for this building: On Sale, over 20% off. Me thinks there will be plenty more of this to come in the next few months. Roger has updated the stats slideshow for December 2008 and included some great yearly and quarterly stats as well. I have a confession to make. I don't buy the paper, but every Friday I seek out the Future Shop ad that comes with it. I usually confine myself in a quiet place for a few minutes and I check out the prices on the tech gadgets. I'll even admit that I may just be a bit obsessive about it. I have no plans on buying anything right now, but if you were to ask Ms. HHV about this, her answer would definitely contain some nervousness, because she knows that I have difficulty resisting a deal. I can admit it's pretty much always been that way. I have trouble walking past the take an additional 70% off rack in The Bay without seeing if that suit jacket, pants or shirt I've been eyeing is on it. Heaven help me if I'm in a bike store and something is on a "too good to be true" sale shelf. Lately the obsession has turned to televisions. I don't know why I'm watching their prices so carefully, we have a perfectly good one at home. But the idea of watching Hockey Night in HD is attractive, despite knowing that the purchase price of the TV doesn't include the extra $200 per year in cable fees or the $350 for the HD box. I've narrowed the purchase choice down to brand, picture type and size, now I'm just evaluating based on price. But I will still argue, vehemently, that I am not going to buy a TV no matter what its price is in three or four weeks because I know the manufacturers will be discounting them further, and thus the stores will be too, as the recession deepens. Still with me? I know you're thinking "HHV, what has this got to do with real estate? Please don't tell me you're gonna start writing about politics next." 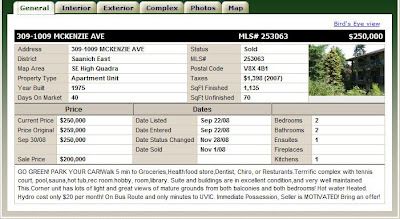 BC Assessment's database for 2009 valuations is active now. Depending on the property, two numbers are available: the July 2007 assessed value, and if the place sold in 2008, the sale price of the property. For a lot of people, I'm guessing here, there will be no sticker shock. Regular readers and me, we've been obsessing about real estate prices together for the better part of two years now. We've been expecting prices to come down. We've been calculating, analyzing, graphing, discussing, arguing and maybe even, dare I say it?, proselytizing the great benefits of cheaper real estate for our much-loved city. But we're the minority in this town. Most people don't give a damn about what their house is worth. They know it's worth more than they paid for it. They know they no longer have a mortgage or know they can afford the one they've got. These people are the silent majority in our real estate market, and probably number close to 50 per cent of homeowners in Victoria. They probably won't even look at their assessments for more time than it takes to shred or file them. It doesn't matter though, because what these people do does not effect the market price at all, because they aren't active in it. For a small percentage of Victorians, I imagine the "frozen" assessments of July 2007 delivered as July 2009, may come as a surprise. These people are the active buyers. They've all heard by now that the market "ain't what it used to be." They've got REALTORS actively presenting low ball offers and encouraging sellers to accept them. Buyers out there are seeking the "good deals" the "experts" quoted in the MSM tell them are everywhere. And they don't trust inflated market values set by the industry players as they currently are. They may be looking to government assessment numbers for a baseline to calculate their requested discounts from. Could this lead to further price reductions? Say you decide to buy a Yaris and they are on sale. You walk on the lot, kick some tires and read some stickers. You see the manufacturer's suggested retail price and then you see the dealer's discounted sale price of 7% savings. What happens if that MSRP suddenly gets rolled back to the price of a Yaris two years ago? That discount the dealer is offering you probably isn't so deep anymore is it? But you've heard the deals are a "once in a real estate cycle opportunity" and you need to act fast. The numbers just don't add up though. You've probably already decided to buy. And you've already decided you are going to get a discount. So you're probably going to demand it. And if you are patient, you are probably going to find someone who will give it to you. Time will tell, but I can see frozen assessment values greasing the downward price slide. Buyers may use them as the new MSRP to calculate their proposed deals off of. What's a must-sell homeowner to do? And what kind of advice do you think their REALTOR is going to give them, especially if sales have been light in the last little while? How do you think the assessment numbers will play out in the market?